When making adjustments to your ergonomic workstation, don't forget the importance of a keyboard tray. The E3 Keyboard Tray by UPLIFT Desk comes together to deliver you a roomy surface for both your keyboard and mouse pad, which lets you type and task in an ergonomically-friendly posture. With the E3 you'll be able to adjust to your preferred negative tilt position when typing, which is recommended by ergonomists to combat wrist strain. The versatile keyboard tray rotates 360 degrees for the ultimate in typing freedom and when installed along the 21 inch track, the tray can be completely stowed away for even more organization at your desk. An adhesive wrist support runs the length of the keyboard tray, keeping your wrists comfortable and your body in ideal alignment so you don't have to worry about things like Carpal Tunnel Syndrome. Enjoy the spacious keyboard tray's subtly sloped cutout, which lets you task closer to your work (and within the advised neutral reach zone). Our most affordable all-in-one keyboarding solution to less-than-ideal keyboard setups everywhere, it's time to type in a better way with a little help from the E3 Keyboard Tray by UPLIFT Desk. Trying to decide which keyboard tray by UPLIFT Desk is best? Take a look at our Keyboard Tray Comparison Chart (PDF). Do I need a keyboard tray? If you're working without a keyboard tray, you might not know what you're missing. Keyboard trays allow you to type and task in a more comfortable or ergonomically ideal posture, with arms relaxed and at 90 degree angles. 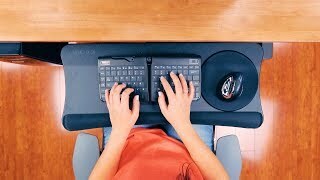 How is this different from other UPLIFT Desk keyboard trays? If you like using a keyboard tray or are currently on the hunt for the perfect one for you, you may have come across the other keyboard tray designs from UPLIFT Desk, like the large keyboard tray and the switch keyboard tray. If you're trying to figure out the differences among the three trays, we can help. Users of the best-in-class large keyboard tray say they love the roomy singular surface for both keyboard and mouse pad, while users of the switch usually tell us they love being able to have a separate mouse platform. If you work better with this separation of mouse and keys, that narrows down your options down to the switch, but users of the single tray design will love the E3 keyboard tray due to its ability to improve your keyboard's ergonomics (and your comfort levels) at an even more affordable price. How adjustable is the E3 Keyboard Tray by UPLIFT Desk? The E3 Keyboard Tray by UPLIFT Desk adjusts from 5 degrees positive tilt to 15 degrees negative tilt. This allows you to choose the most comfortable keyboarding tilt for you, and is easy to adjust when you want to work in a different position. Absolutely! The E3 Keyboard Tray by UPLIFT Desk was designed to rotate 360 degrees, which gives you the freedom to rotate to the best position for the task at hand. How does this install on my desk? The E3 Keyboard Tray comes with 11 and 21 inch tracks, which allow you to install the tray underneath your desk where you want it, even on desks that have existing crossbars. Add an UPLIFT Corner Sleeve to solve the issues of limited depth when trying to install a keyboard tray on the right angle of an L-shaped or corner desk. This low profile mount is available in two different models to attach to work surfaces 1" - 2.5" thick, and is compatible with all UPLIFT keyboard tray tracks. Add a Goldtouch Adjustable Keyboard - GTN-0033 at a discounted bundle price with this keyboard tray. This wired USB keyboard's split design promotes a more natural and ergonomic typing position. The Track Spacer by UPLIFT Desk allows you to mount your keyboard tray track over the crossbars under your desk, giving you more flexibility in positioning accessories, especially on smaller desks. If your desk is only 24 inches deep, this will allow you to place the 22" track over the crossbars so you can stow the keyboard tray completely underneath the desk. $149.00 List Price: $159.00* The list price is the same as the MSRP (Manufacturer's Suggested Retail Price). It may not necessarily be the price at which the product is sold.